The Fort McMurray wildfire that started in Alberta, Canada, on May 1, 2016 burned more than 2,300 square miles, caused the evacuation of close to 90,000 people, and destroyed nearly 2,000 structures and damaged another 19,000. Two fatalities were indirectly tied to the fire. Early financial estimates put the insurance cost at between $2.6 and $4.7 billion dollars. By June 10, the fire was nearly 73 percent contained. By contrast, the 2003 Cedar Fire in San Diego County, Calif., while only one-fourth the size of the Fort McMurray fire, displaced more than 300,000 people, caused 14 fatalities, and destroyed 2,400 structures due to higher population density in the urban-wildland interface. As the effects of climate change on seasonal weather become more evident, frequent and severe wildfires in proximity to residential areas are expected to expose greater numbers of homes and people to smoke and debris from the fire and its aftermaths. As of mid-June, Fort McMurray was under a boil-water order. Air quality throughout the region was significantly affected. Arsenic and heavy metals contamination in some undamaged homes made them unsafe to reoccupy. The alkaline ash—one of the main components of wildfires—acts as a corrosive agent, and dust suppression compounds sprayed on burned structures contain crystalline silica. Reconstruction activities can cause these substances to become airborne. Labor authorities urged employers to take all necessary steps to protect the health and safety of their workers and mitigate hazards once recovery begins. Wildfires can impact property, the environment, and public health from the immediate vicinity of the fire up to several hundred miles from the source. Insurance claims for property damage are the driving force behind most investigations of damage from wildfire smoke. In many cases, these investigations take place several months to a year after the incident. Investigative, sampling, and analytical techniques are primarily intended to confirm the presence or absence of wildfire residues and determine the degree of damage to property and assets. The potential human health effects of wildfire smoke and residues often remain unanswered. Does wildfire residue pose a human health hazard? How do we evaluate the potential health hazard posed by wildfire residue? What are the background levels of similar products of combustion in homes? And what is the appropriate level of remediation and clean up? MODELING EXPOSURE TO WILDFIRE RESIDUES Smoke inhalation can have acute and chronic effects on the health of wildland firefighters. Heating and cooking with wood can also have recognized adverse health effects on household residents. However, there is little information on the health risk to residents from exposure to wildfire residues in homes that are reoccupied after being affected or damaged by smoke. A conceptual model can serve to explore the potential adverse health effects of residential exposure to wildfire residues. In this model, the wildfire does not reach a structure. Instead, smoke from the wildfire descends upon a residential area and enters the home through roof penetrations, make-up air vents, and seams around doors and windows. Gaseous and particulate smoke contaminants entering the building settle on solid surfaces, including HVAC units and ductwork, and some are adsorbed onto carpets, floors, walls, and furnishings. When residents return home days or weeks after the fire, the smoke is no longer a direct hazard. Combustion gases and the more volatile smoke constituents dissipate and become diluted by passive or active ventilation to reduce odors. The fate and transport of the residual contaminants depends in part on housekeeping practices, the chemicals’ partition coefficients, and the type of ventilation. The larger-size fractions of settled dust are removed by regular cleaning, while the respirable-size particulates may remain longer in the absence of HEPA filtration. Adsorbed semi-volatile organic compounds (sVOCs) continue to off-gas following their gas-solid phase equilibrium kinetics for days, weeks, and even months. At this stage, the potential health risk from the wildfire residuals is most likely from inhalation, skin contact, and ingestion of particulates—mainly char and ash deposited by the smoke, as well as the polycyclic aromatic hydrocarbons (PAHs) that have become adsorbed onto the fire particulates and onto surfaces in the home. Sample collection techniques need to consider the desired analysis to maintain sample integrity. EVALUATING HEALTH HAZARDS Wildfire smoke is a veritable cocktail of products of incomplete combustion. Ash and char, the main components of wildfires, may contain heavy metals, PAHs, and dioxins and furans. Research on firefighter exposure to smoke has identified a number of constituents of potential concern: combustion gases, such as carbon monoxide; volatile organic compounds (VOCs), particularly benzene; aldehydes such as formaldehyde and acrolein; a wide variety of PAHs, including pyrene, phenanthrene, benzo(a)anthracene, benzo(a)pyrene, and benzo(b)fluoranthene resulting from combustion of organic matter; and particulate matter, principally in the PM2.5-size range. The health effects of wood smoke inhalation range from acute irritation, inflammatory responses, asthma triggers, and immune system suppression to changes in lung function (measured as increased airway resistance); reduced lung function capacity; chronic illnesses, including bronchitis, obstructive pulmonary disease, and cardiac disease; and cancers of the lung, skin, and bladder. Concentrations of VOCs, PAHs, and particulates measured at wildfire suppression and prescribed burning operations suggest that the primary sources of cancer risk in the range of one-in-one-thousand to one-in-one-million derive from exposure to benzene and formaldehyde, and that non-cancer adverse health effects above a level of concern (hazard quotient > 1) result from exposure to acrolein and respirable particulate matter. In studies of wildland firefighter risk assessment models, neither carbon monoxide nor any of the PAHs detected reached levels of concern. Many of these compounds have also been identified inside homes, which complicates the evaluation of health hazards from wildfire smoke residues. Background sources of PAHs in urban outdoor air and in homes not affected by wildfire smoke include smoke from fireplaces and cigarettes, asphalt pavement sealers containing coal tar, and vehicle exhaust. Background PAH levels in indoor air range from 0.00027 µg/m3 to 0.05 µg/m3, approximately twice the background levels found in outdoor air. PAHs exist in equilibrium between a vapor and a solid phase, and have a strong affinity for organic matter like charcoal. They attach to building materials and furnishings, such as carpet, gypsum wallboard, and even stainless steel, and slowly off-gas for time periods ranging from hours to weeks or months. As a result, PAHs are commonly found as a component of household dust. Typical background levels are in the range of 0.15 to 1.64 micrograms per gram (µg/g) of dust. Dust ingestion by children is the second most important route of exposure to carcinogenic PAHs, after inhalation exposure. However, household dust needs to contain more than 150 times the typical PAH background levels to pose a lifetime cancer risk above one-in-one-million. SAMPLING AND ANALYSIS The residential post-wildfire exposure scenario discussed in this article illustrates some of the uncertainties that must be addressed when evaluating human health risk from wildfire residuals. These include the composition of the wildfire smoke inside a home; concentration of chemical constituents in the smoke; fate and transport of persistent wildfire residual chemicals in the interior environment; partition coefficients of PAHs in char, ash, construction materials, and furnishings; background levels from non-wildfire sources; and the effects of ventilation and housekeeping practices on contaminant deposition and removal rates. 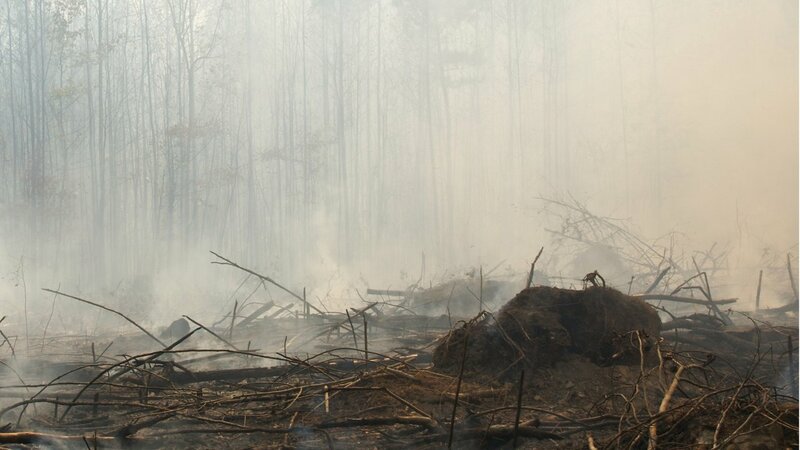 The wildfire impact investigator needs to have a clear understanding of the sampling technique and analytical methods to ensure that they are compatible with each other and meet the desired objectives. Various techniques for particulates, metals, VOCs, sVOCs, or gases are applicable to wildfire residue investigations. The experienced laboratory can help sort through the background “noise” to identify the signature chemical compound combinations that indicate the presence of a particular wildfire residue. Depending on the objective of the investigation, particulate analysis of soot, char, and ash can be conducted through optical microscopy using reflected and transmitted light, transmission or scanning electron microscopy (TEM or SEM) supported by X-ray diffraction techniques for material composition, or a combination of methods. Sample collection techniques need to consider the desired analysis to maintain sample integrity. For instance, wipe sampling with water or solvents can dissolve ash particles and render them invisible to microscopic examination. By the same token, some lab preparation techniques can destroy the sampling media, or the sample itself. Some of the most common sampling techniques in wildfire property damage claims are tape lifts and micro-vacuum sampling for particulate microscopy analysis, often used as part of Visual Area Estimation (VAE) analysis. This method identifies various types of particles in the sample, such as soot, ash, char, mold, cellulose, soil minerals, and other opaque particles, and reports them as percentages or numbers of each component particle in the observed field. The laboratory interprets the percentage or count in a range from normal background to uncommon, and makes recommendations as to the source of the particles or the level of cleaning needed. The results and interpretation of this particle characterization method can vary between laboratories. Because VAE analysis does not determine actual surface or mass concentrations of the identified particle types in the home, it is not appropriate for human health risk assessments. Air sampling methods for gases, VOCs, and sVOCs used in traditional industrial hygiene or indoor air quality investigations can be used in wildfire residue assessments. The objective of the investigation will dictate the sampling and analytical technique. Direct-reading instruments for combustion gases and VOCs can be used for initial screening. Bulk samples of furnishings or building materials can be analyzed in environmental chambers for off-gassing chemicals to identify persistent odors. Due to the long time lag between the fire and the smoke damage investigation, sampling methods that can detect residual concentrations in the parts per billion range (ppb)—such as EPA TO-15 and TO-17 for VOCs, and XAD-coated samplers for sVOCs—followed by gas chromatography and mass spectrometry are often necessary. These methods can detect hundreds of chemicals at ppb and sub-ppb concentrations. The experienced laboratory can help sort through the background “noise” to identify the signature chemical compound combinations that indicate the presence of a particular wildfire residue. Choosing experienced and qualified wildfire residue laboratories and working closely with the analysts to develop the sampling strategy is essential to produce usable and defensible data to support the interpretation of results. This is especially important in wildfire residue investigations due to existing gaps in published standard methods in this emerging area of practice. Sampling and analytical methods specifically designed to quantify concentration and distribution of the wildfire residuals in the building and allow calculation of dose by the major routes of exposure are necessary to evaluate the human health risk from wildfire smoke. Industrial hygienists involved in wildfire residual impact investigations from the health risk perspective need to utilize sampling and analytical methods that can evaluate potential health hazards. This data can also inform the development of clean-up levels and post-remediation verification protocols. ENRIQUE MEDINA, MS, CIH, CSP, FAIHA, is president of Alliance Consulting International in San Diego, Calif., and a member of the AIHA Environmental Issues Committee. He can be reached at (619) 297-1469 or emedina@pulse-point.com. AIHA’s Environmental Issues and Indoor Air Quality Committees are starting a joint Wildfires project to share and disseminate best practices in this area. The committees welcome the participation of interested AIHA members and laboratories. Please contact Enrique Medina for information. RESOURCES American Industrial Hygiene Association Journal: “Occupational Exposures in California Wildland Firefighting” (January 1992). California Air Resources Board: iADAM—Air Quality Data Statistics. California Environmental Protection Agency: Office of Environmental Health Hazard Assessment Toxicity Criteria database. Environmental Science and Technology: “Adsorptive and Absorptive Contributions to the Gas-Particle Partitioning of Polycyclic Aromatic Hydrocarbons: State of Knowledge and Recommended Parametrization for Modeling” (July 2004). Environmental Science and Technology: “Dynamic Behavior of Semivolatile Organic Compounds in Indoor Air. 2. Nicotine and Phenanthrene with Carpet and Wallboard” (February 2001). Environmental Science and Technology: “Polycyclic Aromatic Hydrocarbons in the Indoor and Outdoor Air of Three Cities in the U.S.” (June 2002). EPA: Integrated Risk Information System. Indoor Air: “A Pilot Study to Measure Indoor Concentrations and Emission Rates of Polycyclic Aromatic Hydrocarbons” (December 1991). Journal of Exposure Science and Environmental Epidemiology: “Estimating Exposures to Indoor Contaminants Using Residential Dust” (November/December 2011). Journal of Occupational and Environmental Hygiene: “A Screening-Level Assessment of the Health Risks of Chronic Smoke Exposure for Wildland Firefighters” (May 2004). Journal of Occupational and Environmental Hygiene: “Exposure of Firefighters to Particulates and Polycyclic Aromatic Hydrocarbons” (July 2014). Journal of Toxicology and Environmental Health, Part B: “The Toxicology of Inhaled Woodsmoke” (January 2011). Mutation Research/Fundamental and Molecular Mechanisms of Mutagenesis: “The Mutagenic Hazards of Settled House Dust: A Review” (November 2004). AIHA's Director of Government Affairs, Aaron Trippler, reported in October that OSHA is working on an updated compliance directive for workplace violence. The updated directive is expected to be released in February 2016. The first definitions for respiratory protection terms appeared in a letter to the editor published in the December 1982 issue of the AIHA Journal. Alan Hack, Chuck Fairchild, and Barbara J. Skaggs of the Los Alamos National Laboratory Industrial Hygiene Group proposed definitions for four terms: Fit Factor, Protection Factor, Field Performance Factor, and Worker Use Factor. The letter noted that published industrial hygiene studies referred to "several different measurements of respirator efficiency or performance, with 'Protection Factor' being used to refer to each of them." A response from NIOSH staff in the March 1983 AIHAJ introduced additional terms, including Assigned Protection Factor. The boil-water order was lifted July 15 for several communities south of Fort McMurray. As of late July, the order remains in place for the Abasand, Beacon Hill, and Waterways areas, according to the website of the Regional Municipality of Wood Buffalo.